I ordered my Nexus 5 directly from Google last Thursday. I knew I would be checking shipping detail updates constantly. I was horrified to learn that my order would not ship until this Monday. Thankfully the ground shipping got the phone to my house by Wednesday, while I kept on hitting refresh on the UPS tracking site to get constant updates on its whereabouts. In order to get my Nexus 5 cellular service, I needed to change carriers. Obviously buying the phone from Google, I wanted a no contract/pre-paid plan. This was one of the most difficult processes I had to overcome with my phone migration. 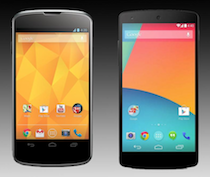 This droid-life.com article provides a plethora of information for Nexus 5 carrier options. For now I’ve decided (gasp…gasp..gasp…) to go with straighttalk.com. So far I haven’t had any major issues, but it’s only been a few days. The main issue I have with straighttalk is that they throttle service after 2.5 gb. To add insult to injury users are slapped down to 2G service. I don’t see why the company can’t just slap people down to 3G ( LTE is the fastest speed ) and the 2.5 gb limit is far to low. As a sidenote while on virginmobile.com I did get a notice one month that I would be throttled after going over 2.5 gb. Regardless in the short-term I probably won’t go over 2.5 gb limit and I can always move my number to a new service. Moving forward I will be rooting my Nexus and looking into methods for making phone calls reliable over the data connection. If anyone has had success with this, then please let me know. 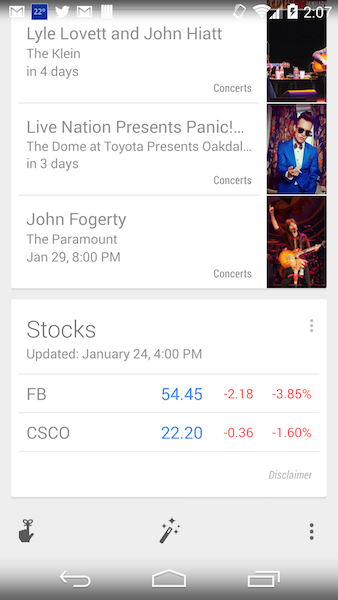 The card area that displays data for each section in Google Now can easily be swiped away when you are done viewing it. 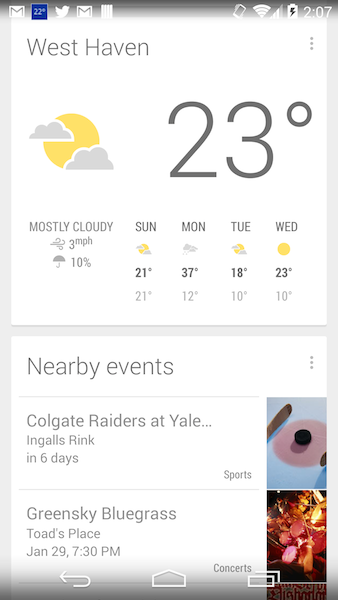 Weather widget is included according to your location. In order to provide better suggestions for cards in Google Now, Google can search your web browsing history and location history. You need to manually enable these features. There is a basic card where Stocks can be added. Nearby events are displayed which can consist of sporting events, live music and theater. Individual events within this card can be swiped out of the list. Each event has relevant links you can visit. Any reminders or alarms that you set with speech can be listed here. If you don’t see these cards you can also scroll down to the bottom of the page and select the finger with a bow wrapped around it to see these events. 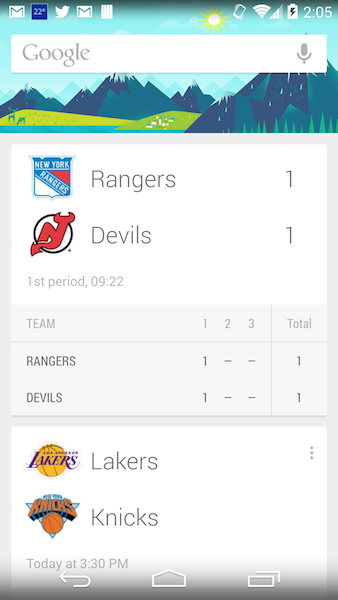 Customization, Settings, Feedback and Help can also be found in the bottom links. 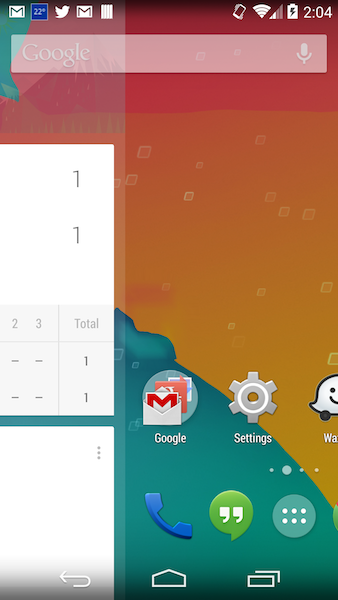 The Nexus 5 sets the Chrome browser as your default browser. The standard Android browser does not come pre-installed. My last phone, the HTC EVO 4 on virginmobile.com, was never able to run the Chrome browser for more then 2 minutes without crashing. This was extremely annoying as Chrome is probably the fastest browser on Android and I like the way tabs are implemented in it. Needless to say Chrome works flawless on the Nexus and is very fast. I had over 15 tabs open recently and there was no slow down in the interface. Only down side with Chrome browsing on the Nexus 5 is that it will drain your battery. Once Developer mode is enabled you will then be given the option of setting your runtime mode. I’m still researching this option and for now I am testing out the experimental ART runtime. For more information on this feature check out this article at infinum.co. The main gripe I have about the Nexus 5 is battery life and the fact that there is adhesive that needs to be removed if you want to open the case. As for opening the case this is one area where I need to do more research. Are users allowed to open the case without voiding the warranty? ifixit.com has a nice tear down video. Overall I have not been impressed by battery life. While driving I use the Waze app for driver directions and information. It can act like a beast on the battery but I was hoping the Nexus 5 battery would perform better in this situation. I will need to look into a battery pack to get better performance. One positive note when it comes to the battery is that it supports wireless charging. In addition a solar battery pack option might make sense for this phone. I’ll need to add these items to my research list. I’ll be adding more items to this article as time goes by. I will probably be adding a Resource/Link section for better organization. I will also be posting some pictures and a review of the Camera.